Over the past ten years the Justkul research team has worked on hundreds of customer surveys for investment deals and strategic initiatives. Many of our clients could execute research themselves, but they have come to value the quality of our work, our expertise in knowing what questions to ask, our skill in avoiding common mistakes, and the way we free up their team’s time to concentrate on other aspects of a deal or strategic initiative. However, there is perhaps one factor more important than all of these: the independence of our research. Unlike most other parties in a particular deal or initiative, Justkul never has significant vested interest in any particular outcome or conclusion: Justkul is paid the same amount whether a deal or strategic initiative goes forward or whether it does not. We believe this type of independence is essential for minimizing bias. In how the data is interpreted or summarized. A lack of independence at any of these stages can produce misleading results, which lead to poorer and more risky decisions. Hence, in order to make sound decisions, it is important to understand the potential causes of bias so that conscious decisions can be made about how to minimize the impact of these causes. 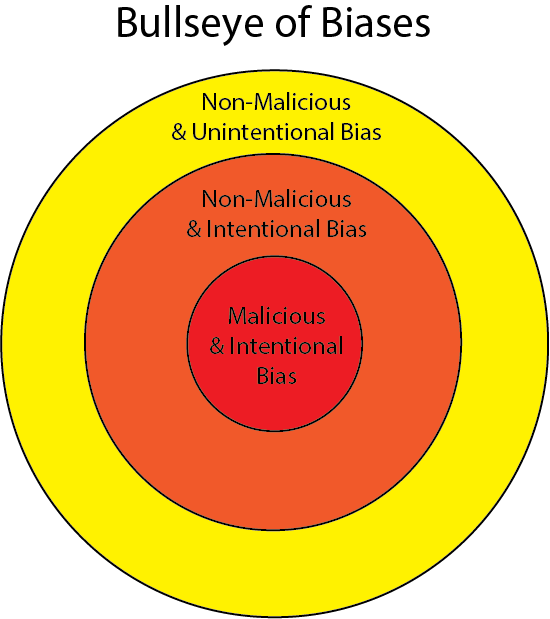 The causes of bias are various, but one way to organize these causes is as the bullseye at the top of this article with intentionally malicious causes of bias in the center, intentionally non-malicious causes of bias in the next concentric circle, and unintentional causes of bias in the outer circle. In this schema the most nefarious type of bias is in the center, but as its relative area suggests, in our experience it is fortunately also the rarest type. Far more commonly, biases arise from the causes in the outer circles. Because of the importance of avoiding this bias, it is worth looking at each of these types of causes in more detail. Intentionally-malicious causes of bias occur when decision-makers make a conscious decision to either lie or omit important details that would be likely to change the overall outcome of a project or decision. “Intentionality” is a complicated concept (See Anscombe, Intention), but in this case, we only mean that it is the result of explicit choices. Justkul team members have encountered this situation on more than one project in the past. For instance, in one project we worked on the buy-side of a private equity deal and were asked to gather customer data on a high-end consumer product company. The potential investment looked great from its own presentations: its products were attractive, prior survey work showed that clients liked the products when they initially bought them, the management team seemed experienced, and the short-term financial data looked solid. Nevertheless, at the time the potential investment had a dark secret it was actively seeking to repress: its products were prone to breaking down. In an apparently deliberate effort to conceal this fact, none of the prior survey work or reports mentioned issues about repair and maintenance, and the company deliberately went out of its way to delay sharing customer contacts with the Justkul research team. The malice of this strategy was made explicit when a leader at the company asked if they could just wait a few more days to share customer contacts, which would mean that we would only get the contacts after the deal closed. This raised red flags and after we communicated it to our private equity client, the deal was eventually called off. In this case, the explicit request from the executive made it fairly easy to identify the bias in the information the company shared. However, in our experience such obviously malicious cases are fortunately rare. More commonly, biases are introduced for non-malicious reasons, either intentionally or unintentionally. 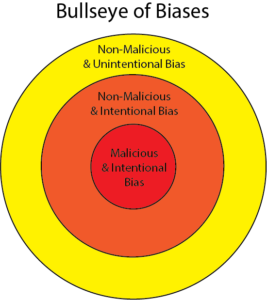 In intentional and non-malicious causes of bias, a conscious decision is made to provide incomplete or potentially misleading data, but unlike the malicious case, decision-makers have grounds to justify their decision. Decision-makers might even convince themselves that they are making the right decision under the circumstances, such as when a company gives into the temptation to ignore survey results that do not fit in with their overall narrative. For instance, a company might nearly always receive a very customer satisfaction score in their internal survey results, but one independently-conducted survey might show a far lower score. Perhaps the company could provide a fairly good argument that because 95% of surveys showed a different result, this result is merely an outlier and can be ignored. However, it might also be the case that there is something wrong with the other 95% of surveys. This suggestion may seem radical, but it’s actually not unusual: perhaps the company’s survey tool was inherently biased to begin with by making respondents only focus on positive experiences, or perhaps there were factors in the recruiting process that encouraged only respondents who were more enthusiastic about the company to complete the survey, or perhaps survey respondents were not assured the anonymity of their results. The importance of anonymity has been underscored for us many times on telephone interviews — ­especially in B2B industries where customer-sales rep relationships are key. In such interviews, a respondent will often ask for reassurance that the interview is truly anonymous before proceeding to give critical feedback. This is the reason Justkul generally insists that our survey respondents be assured anonymity in addition to confidentiality. Finally, the most common case is non-malicious and unintentional causes of bias. Examples are numerous. An investor who has an interest in having a deal go forward might overlook some key hypotheses that would suggest it should not go forward. A consultant who thinks a company should focus on countering the strategies of a specific competitor may overlook the challenges posed by other competitors. A clothing company that believes the quality of its fabrics are obviously better than competitors might be less inclined to put that hypothesis to the test, even though customers may actually perceive the fabric as lower in quality. All of these assumptions can have a significant impact on the outcome of research, and thus produce data that is inferior to research that is conducted independently. Finally, even if data is conducted well—using surveys that are designed not to favor any particular outcome and recruiting participants in an un-biased manner so that the resulting data is truly representative of the underlying population—there is still considerable possibility for bias in the interpretation of those results. Negative data points can be ignored, other positive data points may be artificially promoted, and almost any survey result is potentially manipulated through spin or by ignoring important qualifications. The solution to all of this is to take steps to ensure the interpretation of the research is also independent. Companies often have to rely on self-collected data to make routine business decisions, and this is good and entirely appropriate, provided the company take steps to limit bias in the data set. However, if an unusually important or difficult strategic decision needs to be made, for the reasons outlined here, we believe there is no substitute for data from an independent third-party research partner.